It’s one of those perfect summer days in the Loire Valley and we’ve chosen to cycle from Luynes to Langeais via a loop we’ve found in our La Touraine à vélo book. Luynes is about 50 minutes from Blois by car. You can see the castle as you approach the village. We park in the public parking lot at the entrance to the town just opposite the itinerant circus. I heard on the radio the other day that there are now very few municipalities that have adequate grounds to house a circus. As a result they have downscaled and are forced to stay in the same spot for too long for business to be brisk. Le Saint Venant on the main road is the perfect spot for a coffee before we start the day. It’s very busy, as it also sells cigarettes and lottery tickets. We notice there are several small restaurants open for lunch but we’ve brought a picnic today. Luynes is a very attractive little town. In particular there is a beautifully preserved 15th century half-timber house the front of which used to have two entrances. The present door was the private entrance while the other door opened onto the shop. There are four sculptures: Saint James, Saint Geneviève, the local patron saint, a Pietà and Saint Christopher. There is also a covered market with a very old troglodyte dwelling right next to it. We ride out of town northwards to find a second century aqueduct. The signs are not that easy to find and are also quite low, obviously aimed at hikers and cyclists. The pillars suddenly loom up in the middle of nowhere. I trample through the sunflower field opposite to get a good view of the 300-metre Gallo-Roman aqueduct. There is a bench just opposite so we park our bikes and have lunch there with a perfect view of the nine arches, six of which are the original construction. On our way back into Luynes, we can see the four towers of the castle but can’t get any closer. It’s been closed since June 2016 because it doesn’t respect today’s safety and disability standards. The owner says the outlay is two great for him to make the investment. Only time will tell whether State aid is forthcoming. We continue on our way towards Langeais past lots of interesting troglodyte houses and take a detour to Vieux Bourg, a delightful little village with several old half-timbered and stone houses, outside bread ovens and the little church of Saint Etienne which is unfortunately closed for repairs. They explain that the house was originally a wine-cellar which means it’s quite deep and not easy to ventilate. The main problem is in summer when it remains very cool and has a lot of condensation which is not great for anything electronic. They have ceiling fans to direct the heat towards the lower part of the rooms when heating in the winter. They are trying to find a way to solve the problem. I would love to take photos but feel it wouldn’t be polite. The only one I take is of the ceiling in the main room which shows where steel ties have been used to make sure the ceiling doesn’t cave in! They are both retired and happy with their choice but admit there is a lot of work to be done and a lot of problems to overcome. Troglodyte houses that started off as houses are not as deep and don’t have the same problems. I have to confess that I don’t particularly like the idea of living under the earth! We thank them for their visit and continue onto the town of Saint Etienne which has a very attractive, although quite modern church built in 1860. Cinq-Mars funerary tower built in the 3rd century A.D.
We go past more troglodyte houses until the Cinq-Mars funerary tower or pile looms into view. We’ve seen it often in the past but never visited it. We lug our bikes up an excessively steep hill so that we can see it up close. Built between 150 and 200 A.D. it is a type of funerary tower well-known in Roman times. It is the best preserved and highest funerary stack still extant (29.50 metres) while its brick veneer is rare in Gaul. At the top, twelve decorative brick and white stone panels replace the traditional niche seen on other stacks. The town of Cinq-Mars is only a few kilometers further. We’re hoping for a coffee but there is nothing open. It must have been quite a thriving town once from the look of the stone friezes on the houses opposite the church. We’ve decided to visit the Cinq-Mars castle even though there isn’t much left of the original feudal castle. I don’t quite manage to get to the top of the hill on my bike. It’s one of those day when I think that an electrically-assisted bike might be a good idea. The owner, a retired architect, turns out to be a mine of information and very willing to talk. The price is a reasonable five euro each. We visit the dry moat which is extremely deep, then walk across the magnificent stone bridge with its three arches that replaced the 15th century drawbridge. The two 12th to 15th century towers each have three vaulted rooms one on top of the other, but only one tower is open to visitors. The name itself is derived from the name of the first known owner, Geoffroy de Saint Médard. It became Saint-Mars after André de Saint-Médard died in the Holy Land in 1210 then for some unknown reason turned into Cinq-Mars in the 16th century. The castle’s most famous character is Henri Ruzze d’Effiat, Marquis of Cinq-Mars, favourite of Louis XIII, who was beheaded for treason at the age of 22. According to local legend, the castle itself and even the trees were decapitated. His tragic end inspired Alfred de Vigny’s novel, “Cinq Mars” which I’ve never read. Maybe I should. It’s nearly 5 pm and we are not even halfway along our itinerary. Jean Michel suggests we go to Langeais and follow an alternate much shorter route back to Luynes. We find ourselves on a main road but can see the bike route over to the right which means scrambling up and down an embankment. It’s a very rough path but it’s better than having traffic whizzing past at 90 kph! We finally see Langeais on the other side of the railway track. Somehow we’ve missed our exit and the path gives out. We squeeze past a post and return to the main road but fortunately we only have to take it a short distance. Five minutes later we’re sitting in front of one of our favourite teashops – La Maison de Rabelais, just opposite the castle (which we’ve visited several times before), which is a combined patissier, chocolatier and glacier. After restoring ourselves with an excellent ice-cream, we return via another route which is also a main road. I think I preferred the bumpy path. At Saint-Etienne I ask for a break and we visit the church. Although it is recent – 1860 – I find the inside very harmonious and attractive with its painted pillars and mosaic floors. We arrive back at the car around 7.30 pm and it’s still full daylight. We didn’t get to Château de Champchevrier but we can go there another time. It’s one of the most interesting and enjoyable rides in the Loire we’ve had in a long time! The bike map showing the original itinerary. We only went from Luynes to the aqueduct then onto Langeais. 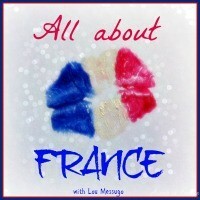 I’m entering this post in Lou Messugo’s All About France monthly blog link-up. For other posts about France, click here. This entry was posted in Architecture, Cycling, Loire Valley, Loire Valley châteaux, Restaurants and tagged cinq-mars castle, cycling in the Loire, cycling to Cinq-Mars, cycling to langeais, cycling to luynes, visiting a troglodyte house. Bookmark the permalink. Saint-Etienne’s church is a real beauty. Troglodyte living is quite out of my experience! I thought it was lovely too. The sooner all those little family run circuses disappear from France the better. Certainly they should be banned from having wild animals at the very least. They are a shame and a disgrace. Yes, I agree, it must have been awful. We had dinner in a troglodyte restaurant in Vouvray once. The food wasn’t wonderful but the room itself was fine despite the fact that it was cold and rainy outside. There is a “greeter” in Amboise who lives in a troglodyte house who is willing to show people around. It’s on my list. This particular circus runs a sort of summer school for children which is quite common in France. I don’t know if there are large animals though. Most circuses these days seem to focus on acrobatics and small animals such as dogs. I agree about the large animals though. I thought the circus you photographed looked smarter than most of the ones you see here. Circus school is really popular, especially during the summer hols. I reckon every kid in the neighbourhood here does circus school at least once. Of course it’s basically acrobatics/gymnastics. Circuses with domestic animals are fine, but my observation of the ones that come through here is that they all have wild animals in cages — lions and Bactrian camels being the favourites. Apparently they are doing so badly these days that they have taken to putting out a collection box for donations so they can feed the animals! The circuses you see on telly are a whole different matter, and nothing like the travelling circuses in rural France. From the France Info interview, it seems that the fact that there are so few towns with facilities to welcome them is a big problem because they quickly exhaust the local audience and can’t move on because there is nowhere to go. I think they are probably hugely outdated now anyway. More people have access to zoos which all have to meet modern standards and they can watch acrobatics on TV. My mind, not my legs, is spinning with wonder at all you saw on this cycle. Thank you for taking me. Helen recently posted…Atherton Tableland’s Stunning Nandroya Falls. Yes, that is how we like to cycle. It’s not about how many kilometers we cover but how much we enjoy it. Living underground is such an odd concept, I know I’d hate it, I’m far too claustrophobic, and love views, but I think it’s wonderful you got to see inside a house. I’m so impressed with all the cycling you do, I can barely ride a bike! (Actually it’s just so hilly around here that that’s my main problem). Following on from the conversation you’re having with Susan Walter there’s a huge travelling circus that comes once a year nearby. I lost count at 20 semi trailers parked around the big top and over 50 caravans/motorhomes but what really upset me was seeing 5 large elephants in a tiny tent kicking the dust and swaying in boredom. It’s so wrong these days! Thanks for linking up to #AllAboutFrance I always enjoy reading about your trips. Jean Michel loves telling the story of my first bike after we met. It was a Dutch bike and he was convinced I’d never ride it more than a couple of kilometers. I built up my skills and endurance gradually and I am so glad I persevered. It’s such a wonderful way to visit a country. You just need an electrically-assisted bike for the hills. We’re seriously looking into it as our knees get older. How sad about the elephants. I agree that it’s wrong to keep large elements under such terrible conditions. Yet France has such strict laws about zoos. You have some great photos — especially those of the ruined aqueduct, which looks almost abstract. We’ve driven past many of the troglodytic sites and wandered what it must be like inside, so your post was a great insight into that very distinctive French subculture. Thanks, Richard. It was quite amazing coming upon the aqueduct. I’m going to try and visit a couple more troglodyte homes, making sure that I can photograph the inside as well. It really is fascinating as they are so widespread here. What a fantastic cycle and great photos. I love visiting places on bikes, somehow it just makes it all that little bit more special, rather than just getting back in a car, glad you found a tea room though, refreshments sounded as if they were certainly needed! We just had friends staying who cycled from Dielette, at the top of the Cherbroug Peninsula all the way down to us in the Charente Maritime, they said it was the best holiday they’ve ever had and are quite hooked! I’m always stunned at the hundreds of thousands of years of history that are around every corner in France – especially compared to the US, where historical means at least 100 years old! I want to go see the troglodytes, now. They remind me of Capadocia in Turkey where there are a lot of lava formations and people have carved dwellings into them. It was an amazing landscape – now I need to go see the French version. However, I’ll leave the pedalling to those more fit than I am. Thanks! We seem to get a lot of travelling circuses round here in Normandy and I hate seeing their sad animals. I have never been and refuse to let the boys go but they do still seem popular. That’s the great thing about a bike – you can always cut the journey short!